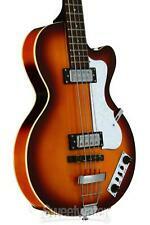 NEW HOFNER HI-CB-SB CLUB BASS GUITAR GREAT UK VIBE VINTAGE SUNBURST super light. Condition is New. Shipped with UPS Ground. Only thing not original is the neck pickup has been rewound by Tom Brantley. Serial number on fret board is 1175. Typical Hofner Beatle Bass with rosewood fretboard, maple neck, plywood violin style body and light brown sunburst finish. The Hofner Galaxie bass is very comfortable to play scale length is 34". and it looks SUPER cool!This Guitar is a Great Sounding Guitar I set it up myself, the neck has been adjusted IT HAS A NICE LOW ACTION. Includes bass guitar, case, strap, extra strings, pick guard/screws. Local pick-up. This is a Near Mint Condition Hofner Contemporary President Bass Hollow Body Electric Bass Guitar. INCLUDED A USED CASE. Classic Hofner Sound in a Modern Jazz Box Bass! Whether you're going for jazzy vibe of a warm and satisfying tone, the Hofner Contemporary President Bass is an excellent choice! 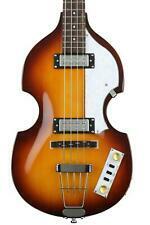 HOFNER HCT500/1 BEATLE LEFT HANDED BASS GUITAR. Recreating the style of the 1964 version, but it features a sustain block inside the body to give modern, deep-resonating bass sounds while still retaining the original Hofner Beatles bass sound. This is a Near Mint Condition Hofner Contemporary President Bass Hollow Body Electric Bass Guitar. Classic Hofner Sound in a Modern Jazz Box Bass! Whether you're going for jazzy vibe of a warm and satisfying tone, the Hofner Contemporary President Bass is an excellent choice! So, if you're looking for that iconic warm, woody, and almost acoustic tone, then you'll be thrilled with this Contemporary Verythin Bass! This is a Mint Condition Hofner Contemporary Verythin Bass Semi Hollow Body Electric Bass Guitar. Body Shape Verythin Bass. Neck Joint Hofner Verythin Bass Set Neck. Type Hofner Fretted. Pickup Neck Hofner Staple Nickel. Pickup Bridge Hofner Staple Nickel. Strings Hofner HCT Roundwound. Action Treble String at 12th Fret 2mm. The Hofner Club is a great lightweight semi-hollow electric guitar with a full & crisp tone that is a real joy to play. The neck is slim, very comfortable & easy to play. Its great for Jazz, Fusion, Funk, Rock, or country.